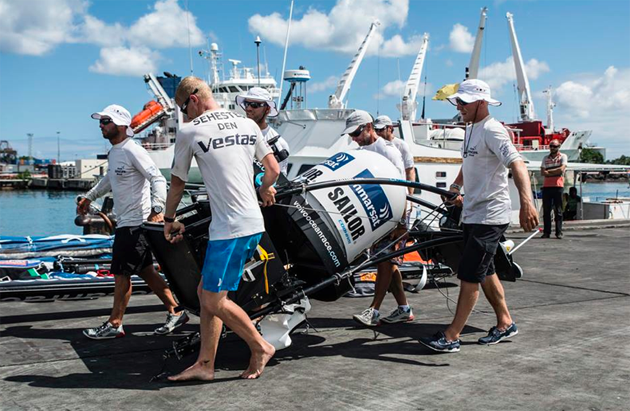 Good to see the Vestas Wind crew safely ashore on the Island of Mauritius after their hair raising experience from which they are lucky to have escaped uninjured. The crew returned to the yacht to retrieve what they could of the most valuable equipment and,as it was described in reports,” to do their best for the environment” which is a beautiful lagoon inhabited only by colonies of seabirds. They were concerned to remove such items as oil, fuel, ,batteries, etc. There is much talk about the possibility of salvaging Vestas Wind and re-entering the race a later stage but one would have to wait and see on this one and, in the meantime, be thankful all are safe and well.